There are as many opinions on the need to pick up horse manure on trails, as there are flies on…flypaper. The public is generally uninformed about the attributes of equine manure and likewise ambivalent about the whole pile of goods. And, they can be very vocal about their trail ‘findings’. Angry, annoyed, disgusted or amused, non-equestrian comments range from the “poop is icky, riders should get off and take it away” to the “what’s the big deal, I love the smell of horses!” genre. Unfortunately, comments usually end up going beyond expressions of opinion to demands for action, in the form of trail and parkland restrictions. It is our task as equestrians to help the public to understand the…er…Ins-and-Outs of Horse Piles: Their Role and Impact in the Real and Natural World. Or something of the sort. Those of us that ride trails know that dismounting, picking up the often scattered road apples, packing them up and remounting can prove to be a challenging, if not downright dangerous feat. Some implements have been devised for from-the-saddle pickup. It may depend upon how much polo practice you’ve had as to how successful you’ll be at snaring your beast’s release. In many areas, trail clubs and organizations or trail managing agencies will schedule manure pickup days. This approach, when publicized and schedules adhered to, can help to sooth the concerns of disgruntled, lower-to-the-ground users. Beyond the Ick Factor – What’s That in My Drinking Water? The issue of ground and surface water pollution, though unrelated to the Pedestrian Poop Encounter (PPE) issue, may also be a consideration in park and trail manager decisions to restrict equine trail use or mandate manure pickup. But is this decision, based on the belief that horse manure on trails is detrimental to water quality, based in fact? Not a lot of research is available, even today, to support a definitive answer to this question. In a paper prepared by Adda Quinn for Enviro-Horse (March 1998, R.3 October 2001), she informs us that “horse manure is a solid waste excluded from federal EPA solid waste regulation because it neither contains significant amounts of hazardous chemicals, nor exhibits hazardous characteristics. The chemical constituents of horse manure are not toxic to humans. Horse guts do not contain significant levels of the two waterborne pathogens of greatest concern to human health risk, Cryptosporidium or Giardia, neither do they contain significant amounts of the bacteria E. coli 0157:H7 or Salmonella.” Good to know. That being pointed out, more recent concern on the part of municipalities due to tightening EPA water quality requirements (and some Really Big Fines), reminds us that horse manure (and urine) in large concentrations, such as that generated in holding paddocks and manure piles, can be detrimental to surface and groundwater quality, and that this is the big concern. Though manure on horse trails is not, for the most part, concentrated, and can quickly and harmlessly break down, designing trails to drain properly and locating them away from bodies of water makes sense and should be a design standard. To the general public though, it’s all a matter of perception. Either in response to public complaints or due to concerns about environmental quality, communities across the nation have grappled with the issue of manure disposal. Ordinances are proposed, discussed, implemented, ignored, challenged, repealed and proposed again. But rarely is there an effort made at the state level to legislate the largesse of leavings on trails as there has been lately in New Hampshire. Over the last year or so, ELCR has spoken with Patricia Morris, Esq., a Center Barnstead, New Hampshire attorney, horse owner, equestrian trail rider, and advocate for better laws and rules for equestrian use of the state’s trails. 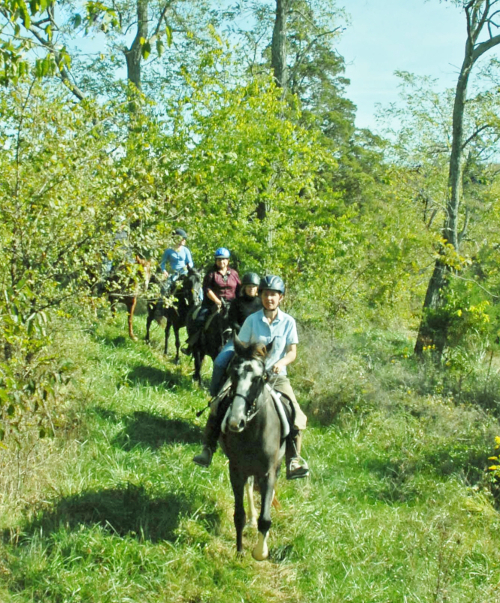 A proposed 2013 change to state rules that govern horseback riding access to trails, which would have placed undue restrictions on equestrian trail riders (especially in regard to manure removal), motivated Ms. Morris and the equine community to take action. According to Ms. Morris, New Hampshire law (RSA 216-F:2) considers horseback riding a primary use of the state’s multi-use trails, and the State with is not supposed to interfere with that use to any great extent. (Carriage driving is not considered a primary use, but is not specifically prohibited). Access rules in force since 2006 prohibit horses except in specific areas, i.e. where “blazed” trails are road-width. But in 2013, further trailhead restrictions were added, along with a mandate to remove manure from all horse and multi-use trails. Like, now. Before you ride away. Needless to say, the equine community spoke up, and several public hearings, with hundreds of equestrians present, were held by the NH Department of Economic and Resource Development (DRED), manager of 300 miles of the state’s rail trails and over 220,000 acres of parks, where the multi-use trail system is located. As a result, this tenacious group of equestrians succeeded, with the help of two state senators, in producing new legislation that turned the rules around. The final proposed version of SB 251’s rules will go to the Joint Legislative Committee on Administrative Rules for approval in early 2014. 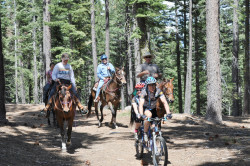 The new rules permit horses on all trails other than a few high human-use areas such as picnic areas and athletic fields. It also removed restrictions on carriage driving, now allowed without a special permit on portions of the trail where posted. The mandate for manure removal was much softened; riders can scatter manure off the trails when it is safe to do so, and must remove manure in the public traffic areas and above the high tide mark at Hampton Beach. Pretty typical of most places, according to our information. How was the horse community able to come together to affect this positive change, and how will the change be safeguarded? Members of New Hampshire equestrian and carriage driving groups have come together to form the New Hampshire Equine Trails Coalition, which now works with state agencies and DRED to ensure continued equine access to the state’s parks and trails. 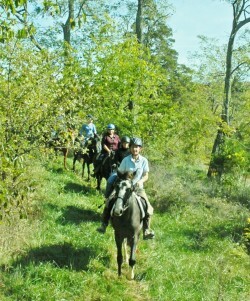 Ultimately, this is a story about maintaining equine access to public lands and trails. 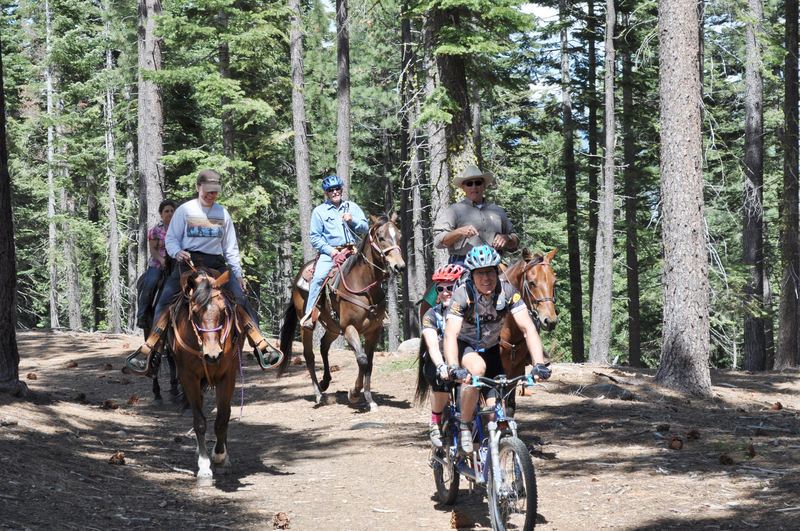 The specific issues, such as manure pick-up, water quality, trail design and location, and the laws and rules that govern trail and land use, are ones that neither land managers nor horsemen can be complacent about. Our country’s population is growing, and competition for recreational space by the many user groups is intensifying. 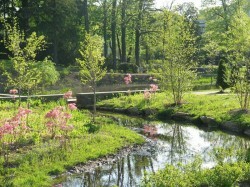 There are economic ramifications attached to the loss of equine trail use. So educating the public and being vigilant about advocacy will help the equine community to maintain, and perhaps expand, our access to our public trails. Being vigilant is key because just as the equine community got past DRED’s proposed rules, and this article gets ready to go to print, the Department of Environmental Services just revised a rule affecting 8000 acres of the Manchester WaterShed area to ban any and all equine use. So stay tuned!